This splendid low dish, with its shimmering rainbow iridescence and swirling peacock feather pattern, gives up its secrets thanks to a small golden label. 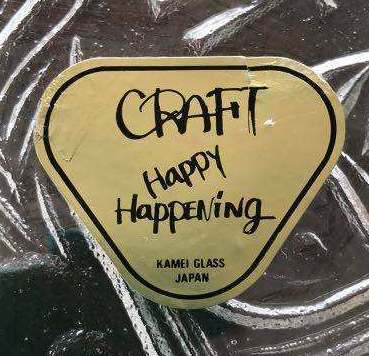 Below “Craft Happy Happening” are the crucial words, Kamei Glass Japan. The dish, found by Australian collector, Rebecca Niekamp, is a large and impressive piece, measuring almost 14 inches (35 cm) in diameter. The exquisite peacock feather design is moulded on the underside of the dish, while the rainbow-like iridescence has been applied to the upper surface – the finished effect being a radium shimmer of purples, blues and gold. The maker of this unusual example of Contemporary Japanese Carnival Glass was the Kamei Glass Company of Osaka, Japan. The company produced a range of glass including tableware, novelties, vases and “Art Glass” from their inception in the 1960s through to their closure in the mid 1990s. Kamei’s Art Glass range was often high quality glass, and is often mistaken today for Sklo Union, Scandinavian or Murano Art Glass. Their Carnival items (iridised and with a moulded design) appear to be scarce. All the photos are courtesy of Rebecca Niekamp who has named this pattern Kamei Peacock Tail. Such a very appropriate name! ​The choice of the peacock feather motif, coupled with the lovely iridescence, was clearly intended to embrace the idea of Tiffany Glass and Carnival Glass. ​but also in its appearance. "Trade catalog. 1985, 216 pages. Includes prices in Japanese yen. Includes novelties, clocks, perfumes, colognes, art glass, stemware, vases, swizzle sticks, glass animals and novelties, decanters, pitchers, jugs, tableware, tumblers, and much more. Catalog is in Japanese, with title and some captions in English." It’s clear that Kamei made a very wide range of glassware; indeed 216 pages surely features a lot of glass. The company exported to the USA among other places, setting up a trading company specifically for that purpose in 1985. So, if any of our readers ever happen to find themselves in Corning, NY and want to while away a few hours, we’d love to hear what’s in that 1985 catalogue.